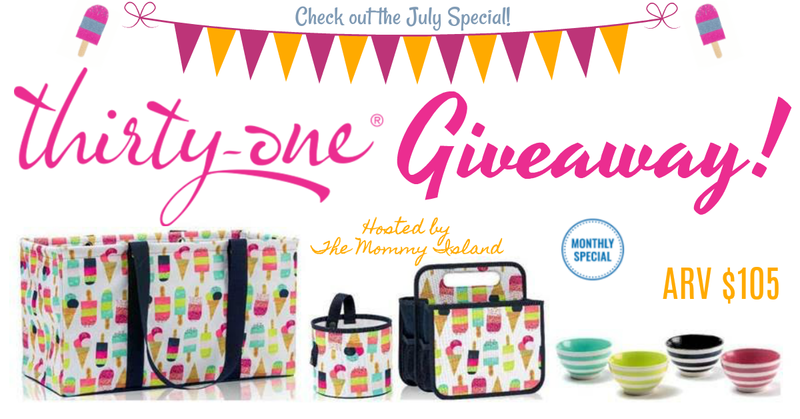 The Mommy Island: This July Thirty-One Gifts Celebrate Ice Cream Month! This July Thirty-One Gifts Celebrate Ice Cream Month! I received products in exchange for this post. All opinions are my own. Sponsor is responsible for prize fulfillment. I scream, you scream, we all scream for Ice Cream! Did you know July is Ice Cream Month? Now that's a holiday I want to celebrate! Growing up my favorite flavor of ice cream was always chocolate, I rarely tried new flavors. As an adult, I still like to stick with the flavors I know I like, but occasionally I will risk it and try something new. July is my birthday month and national ice cream month, I think it was meant to be! All this sweetness really makes me want to party. Thirty-One Gifts was ready for ice cream month with their delightful limited-time collection Sweet Sprinkles. I'm excited to introduce you to their new design and bring you the sweetest giveaway from Thirty-One Gifts! The July monthly special from Thirty-One Gifts is super sweet! The new ice cream print, Sweet Sprinkles, is offered in three products – their best-selling Large Utility Tote, the Double Duty Caddy, and Oh-Snap Bin. The ice cream cone and popsicle embroidery may be put on most products, along with text such as a name, phrase, or meaningful message for gift-giving. When combined with the new Get the Scoop Bowl Set, you're ready for entertaining in sweet summer style. Thirty-One is offering products with the new Sweet Sprinkles print, along with the Get the Scoop Bowl Set as both customer and hostess specials in July. With any $35 purchase, customers may get up to two sale items, including the Double Duty Caddy for just $10 (regularly $25), the Oh-Snap Bin for $5 (regularly $10) or the bowl set for $15 (regularly $35). Hostesses who host a Thirty-One party in July are offered a five-piece Scoop N’ Style Bundle for $35, worth $269 when they host a party where sales total at least $600. website find a Thirty-One Gifts Consultant. Consultants are located throughout the U.S. and Canada. Enter For A Thirty-One Gifts Sweet Sprinkles Package! Pinstripe Punch is also very cute! I love the Loopsy Daisy Lil' Go Backpack! I love the Stand Tall Bin in Playful Pinwheel. I can see a million different uses for this and it so cute. Would love to give that to my daughter!! I am loving the new sweet sprinkles pattern! So cute and great for summer so that is what I would choose. Love Thirty One products! I keep all our splashpad/pool stuff in a large utility tote in the back of my car. I like the Candy Corners print. But they have so many that it's hard to choose a favorite. Depends on what I'm using it for. I like the Hanging Traveler Case in Candy Corners. I really like the Sling-Back Bag - Totally Tartan too. I also really like the summer fun caddy in fun flops! One can never have enough of thirty one.. I need some new utility totes when bringing in my groceries and such Thank you for the chance to win them! I like the loopsy daisy thermal lunch tote. Thank you!! Omg..how I love @thirtyonegifts ans have been a fan for over nine years. Love everything they sell..especially, weekenders and all the thermal totes..living it hot south Florida much needed and frequently use for beach and road trips. Patterns has always been the draw for me..fun, kitchy, sophisticated..they cover it all..one or two current faves is lakeside and the adorable flip flops..I live in them. I also love the "Lakeside Tote - Pinstripe Punch" Love the colors and the style.. The easy going wristlet wallet in the candy corners would be nice to have for summer travel. I absolutely love the Large Utility Tote in the Ice cream Bar Print. Such a great size tote.. I like the "Loopsy Daisy" print as well! I love flowers. I also like the Double Duty Caddy. This would be useful for a lot of people. Another product and design I like is "The New Day Tote - Loopsy Daisy"
Entering this on Mom Does Reviews blog now. Cutest giveaway! Thank you for your part in this! I would like to have the mini zipper pouch in the totally tartan. I also like the Preppy Pop in the Tall Organizing Tote. Another Product & pattern I like is the "Cinch Sac - Navy w/ Topsy Turtles" it is so adorable and so useful. The price is awesome too..
Topsy Turtle little caddy is adorable. Another product and pattern I Like is "All Packed Duffle - Navy Doodle Dot" Awesome I Love it!! Back to school items and sales are already going on! I love the Loopsy Daisy utility tote. The littles carry all caddy bicycle bag is darling. I would like to have the celebrate card set on hand. My granddaughter would love the Loopsy Daisy Lil' Go Backpack! Love the chic lakeside limited edition tote! I like the Easy Going Wristlet - Candy Corners. Thanks. I love that they offer embroidered pillows! Another Product & Design I like is: Stand Tall Bin - Black Twill Stripe I would use it for my rolls of Christmas Paper. Should work well.. I absolutely Love the Fold-Over Weekender - Brushed Bloom Its so Pretty.. I love that it folds and has a zipper to close. The Print is Gorgeous!!! I also like the Deluxe Organizing Utility Tote in Chevron Squares. The new mini catch bins are also a really cute idea. Lakeside tot..darling flip,flop patterns too. Another Product I would love to have is the Little Dreamer - Herringbone Weave Tote I love the style and The herring bone print w/ the solid black leather about 3 inches from Bottom up! The crossbody bags are great to carry a few essentials and go! Love love the flip flop print..darling and whimsical. I like the deluxe organizing utility tote. So cute! So so many darling prints. With school just around the corner, the Loopsy Daisy Lil' Go Backpack is very cute! I really dig the Picnic Thermal Tote in the Brush Strokes pattern. I like the Going My Way Backpack in Candy Corners pattern! I've been a fan for nine years. Every season they outdo themselves with their darling prints and solids. Love their weekenders, thermals and totes most. Right now this icecream print has my heart..equally so does the lakeside print tote shopper and the darling flip flop print cinch bag! I went to the Sponsors shop and I love the: All About The Benjamins - Tan Metallic Cork Wallet. Just love the color and design..